We all know it is essential to focus on areas that people traditionally associate with career development (like getting your CV right and all those other basics), but it is important to realise that career development can encompass many different avenues. A new field which is becoming increasingly popular and important is that of writing for an academic publication. Sometimes the words ‘academic publication’ can be off-putting so we were very enthusiastic to help Helen Fallon, deputy librarian of Maynooth University, give a workshop. The workshop attempted to increase the confidence and motivation to write as a starting point. Helen also explored identifying what is publishable and where to publish. What attendees seemed to react to most positively was the drafting of actual written pieces and for constructive criticism. It can be difficult to stay focused about an area that you have little or no experience with, but the practical element of the workshop was really well received. You can read Shona Thoma’s blog post about this event here. If you weren’t able to make it on the day (and weren’t checking #laicdgacd on Twitter) you can read a storify about the event here. Thank you to all who came along, to everybody who helped, and special thanks to Helen Fallon for organising such a fantastic workshop. Tickets nearly sold out for academic writing workshop! We are nearly sold out of tickets for the academic writing workshop. If you are free on the 4th of October and writing for academic publications is something you need to do for your job (or to improve your CV) then this is the event for you. Not only will it be an intimate event, but you will be guided through the process by NUI Maynooth’s Helen Fallon, who has practical experience in the area. For more information, see our flyer below. Author laicdgPosted on September 13, 2014 February 2, 2015 Categories Academic Writing WorkshopTags academic writing, career development, library events, NUI MaynoothLeave a comment on Tickets nearly sold out for academic writing workshop! 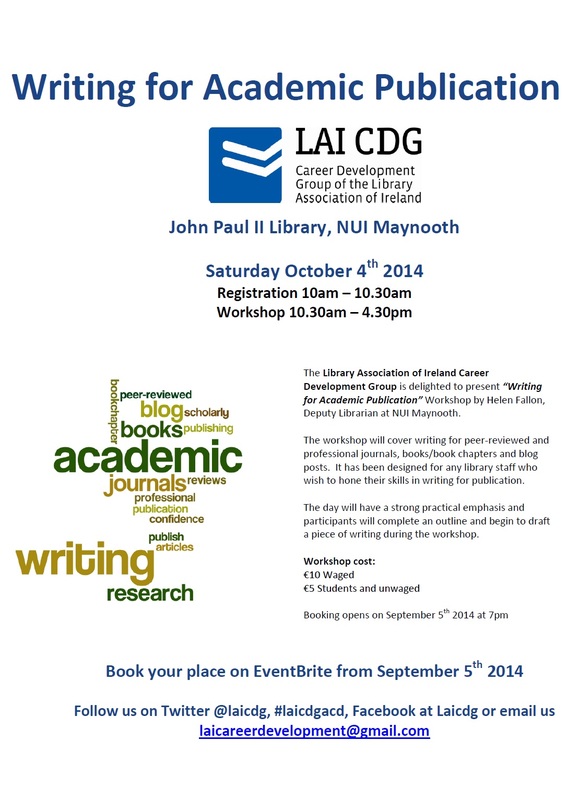 Book your tickets for LAICDG’s academic publication workshop! Save that date! You can now book tickets for the hotly anticipated academic publication workshop run by NUI Maynooth’s very own Helen Fallon. Author laicdgPosted on September 5, 2014 February 2, 2015 Categories Academic Writing WorkshopLeave a comment on Book your tickets for LAICDG’s academic publication workshop! There are so many ways to further your career development as an information professional, and one of those is writing for an academic publication. This is sometimes overlooked as a plausible avenue for those in the field, but given its growing importance, the LAICDG is delighted to announce a workshop by Helen Fallon, Deputy Librarian at NUI Maynooth. The workshop aims to cover areas such as peer-reviewed journals, books and blog posts. As it is a workshop, there will be a strong emphasis on practical participation in drafting a piece of writing during the workshop. This is a wonderful opportunity to gain experience in an area that few in the field possess and to work under the guidance of somebody with practical experience. Given the nature of an event like this, and the high demand that we expect to receive, tickets are limited, so we strongly advise to book your place as soon as the tickets are advertised. Booking opens on Eventbrite on September 5th at 7pm and are priced at €10 (waged) or €5 (unwaged). Don’t forget to follow us on Twitter (@laicdg), Facebook or email us (laicareerdevelopment [at] gmail.com).